"When my husband had his first heart attack in 1955, I knew I had to make a living. I remember one night, it was about two o’clock in the morning, and I was thinking, What shall I do? I hadn’t learned anything, I had no craft. So I said to myself, I have to start something. Probably it will be something I will do for the rest of my life, so it has to be worthwhile for me. I would like to contribute something. Whatever I start, I have to put in it everything, all my life experience, all that I love, and all that I am interested in. I decided I would like to publish. I would like to combine words and images and only words and images that I like." Tatyana Grosman - Particular Passions: Talks With Women Who Changed Our Times. 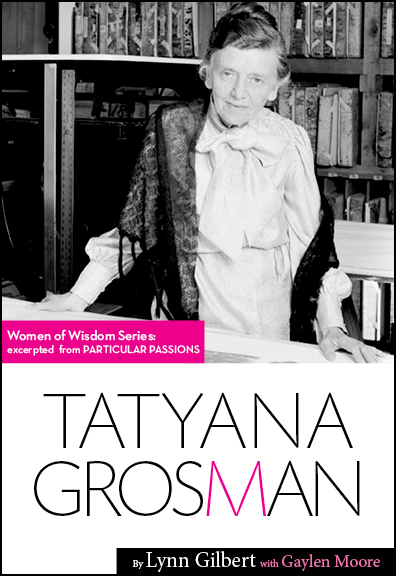 The oral biography of Tatyana Grosman, who founded a unique publishing house that elevated print making to a fine art, and nurtured the careers of artists who became giants of twentieth-century art. Wouldn’t dreams be coming true? All the whole year through." On the cusp of 2012’s last day, with that eternal hope, we move on to the next year, a little older, and a little wiser. I would like to pour a glass of champagne and toast in the New Year with you but as I can’t, I can offer something that will give you pleasure that will certainly have more lasting value. Check out one of the chapter’s from Particular Passions: Talks with Women who Have Shaped our Times which recounts the rich oral histories of pioneering women of the twentieth century from the arts and sciences, athletics and law, mathematics and politics. It isn’t "the bubbly", but it’s cheaper than champagne…(if you were to buy it)…It’s only $0.99 and I know these stories will inspire you going in to the New Year. Try the Tatyana Grosman chapter. What she did with her life will touch your soul and make you realize anything is possible. Tatyana Grosman on Amazon and Apple. On the 6th night of Chanukah, I'd like to share with you a gift that will enrich your soul. Read the chapter of Tanya Grosman, from Particular Passions: Talks with Women who Have Shaped our Times, the story of a Jewish woman, who came from wealth and privilege but lost everything when her family fled Russia. With imagination, courage and doggedness, she learned about lithography, developed a business with techniques that noone had been using in America, drew artists like Jasper Johns, Rauschenberg, Jim Dine to her atelier, collaborated with them, and nurtured news skills. They went on to became icons in the world of art. Tatyana Grosman followed her own path. Backed into a corner with an ill husband, no marketable skills and the need to make a living, She revived lithography as a fine art in this country by establishing a unique publishing house, ULAE. She chose the artists she wanted to work with and helped nurture their careers as they went on to become giants of twentieth-century art world. She faced challenges with imagination and courage, and made decisions with skill. Her story inspires anyone going through rough times. Be entertained and moved by the oral biography of Tatyana Grosman. Enjoy this short and inspirational chapter from Particular Passions by sharing the story with your social network: Facebook / twitter / LinkedIn.